A brand new Shazam! poster is here to show off the fun side of the DC universe. 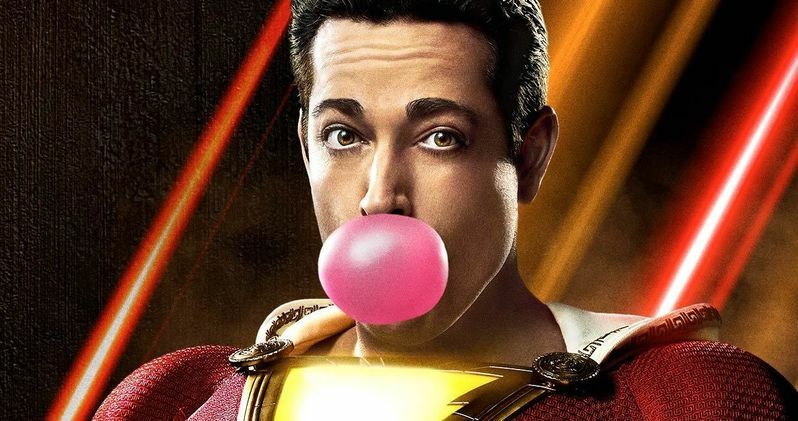 Zachary Levi debuted the poster on his social media channels and it features the titular hero front-and-center, but not looking quite as heroic as the typical superhero. While Levi looks to be in top hero shape physically, he's busy chewing bubble gum and checking his phone, all while posing rather casually. Levi had this to say when sharing the poster. "Heyooo! The new poster for shazammovie is herrre! Aaannnd, there's a new trailer coming in the new year. #ShazamMovie - in theaters April 5th. Mark. Them. Calendars. Y'all." The good news? A new Shazam trailer is coming down the pipeline. The bad news? It's not coming until 2019. Even though Warner Bros. is set to showcase the movie at Brazil Comic Con this weekend, it looks like they're going to focus on Godzilla: King of the Monsters, as far as trailer debuts go. Even though it would have made sense for them to put out a new trailer to attach to Aquaman, which hits theaters in a couple of weeks. For the time being, this poster is going to have to do. Not to feed a fed horse even more, but this poster serves as another reminder over the whole muscles controversy (if one can rightfully call it a controversy) regarding Zachary Levi in Shazam. Prior to filming, the actor was getting jacked in the gym for the role and once some set photos started creeping out online, fans were quick to notice that the suit looked padded. Here, the character is looking casual, but also like he could duke it out with Superman, if need be. Is that the work of pads or the gym? We'll find out next year. This is also going to be a big moment for the DC universe. Warner Bros. has been course correcting ever since Justice League failed to meet expectations, both in terms of reception from fans and the critical community and at the box office. While Aquaman is the first link in that chain, the project was already pretty far down the tracks once Justice League hit theaters. Shazam, on the other hand, should be more representative of the future, since it was largely made once the course correction began. Both movies make it clear that the future will be bright, light and fun, as opposed to the darker Zack Snyder vision displayed in movies like Batman v Superman: Dawn of Justice and Man of Steel. Asher Angel, Mark Strong, Jack Dylan Grazer, Djimon Hounsou and Grace Fulton also star in the DC adaptation, which comes from director David F. Sandberg (Lights Out, Annabelle: Creation). Warner Bros. also has the Joker origin movie, Birds of Prey and Wonder Woman 1984 coming down the pipeline through 2020 on the DC front, with many other projects, such as The Batman, Suicide Squad 2, Blue Beetle and many others at various stages of development. Be sure to check out the new Shazam poster, as well as Zachary Levi's Instagram post, below.